Embark on a journey with Ajax as we carry them to the top. I was standing by the bus stop with my high school friend, who was an amateur football player at a local club. Once we realised we missed the bus my friend took a big relief and lighted his last cigarette. "How are you managing," I asked him. "Managing what?," he calmly replied. "I mean how can you smoke and play as a wing back at the same time?." I emphasised. He then inhaled a large volume of smoke and exhaled smoke rings as he lifted his head up and told me, "Have you heard of Johan Cruff?" Then he showed me the the picture below. 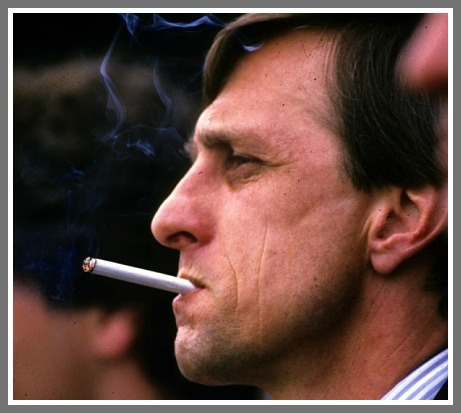 I knew Johan was a legendary Ajax and Barcelona player but little did I know that he used to smoke as much as 20 ciggies per day. I was baffled and amazed at the same time. When Cruyff passed away in 2016, the football world was in a great mourn. Although a few variations of his football mentality lives on today, Ajax needs to be resurrected from its ashes from the 70's and rise up to the top of the European football with totaalvoetbal, commonly known as total football. The best way to put totaalvoetbal in Cruyff's words, totaalvoetbal is a football mentality in which do you not only have your best eleven on the pitch, but also eleven different talents whose collective mentality made Ajax thrive in the 70s. The squad is rich in terms of both young prospects and depth. As per the tradition, I would like to nurture young players and make them indispensable members of the team. The reserves team possesses very good talents that could be utilised in the main squad if need be. Here is the main starting XI with their alternatives. 1. "Technique is not being able to juggle a ball 1000 times. Anyone can do that by practicing. Then you can work in the circus. 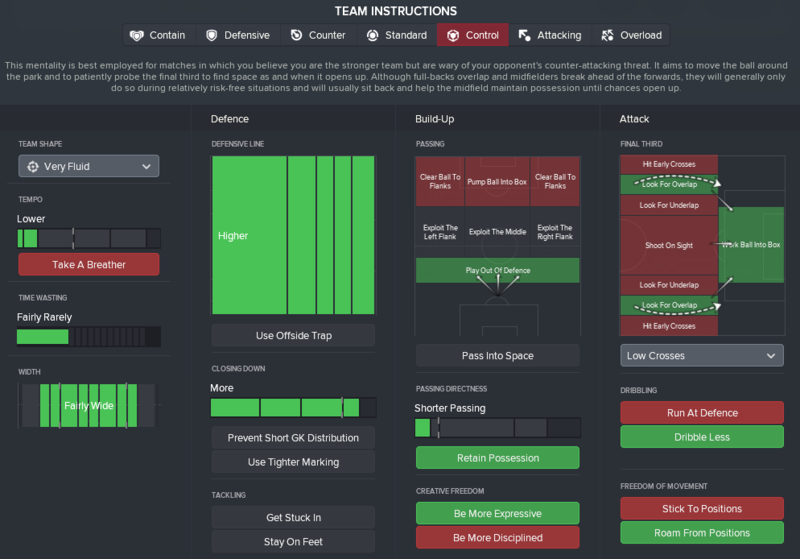 Technique is passing the ball with one touch, with the right speed, at the right foot of your team mate." 2. "Choose the best player for every position, and you’ll end up not with a strong XI, but with 11 strong 1’s." 3. "In my teams, the goalie is the first attacker, and the striker the first defender." 4. " There is only one ball, so you need to have it." 5. "If you have the ball you must make the field as big as possible, and if you don’t have the ball you must make it as small as possible." These 5 points will shape how we will be playing. The first quote refers to cycling ball with one touch around the pitch. The team report suggests that the players tend to have an impressive first touch which reinforces their technical quality. The second point refers to high levels of collective and individual teamwork. This point is the foundation of our tactic. We must rely on every single individual's ability to work collaboratively when attacking and defending. The third point supports this statement; we need to press high up the pitch and win the ball when out of possession whilst we also start attacking moves from deep. Point 4 refers to possession football. It's pretty self-explanatory. Lastly, we are going to play wide once we have possession while also looking for overlaps to bring a variety to attacking moves. This is the best way I could implement the above points in the game. We play with the classic 4-3-3. However, this formation is very fluid, meaning that it can transform into 3-4-3 in line with Johan's mentality. The half back drops deep to provide passing options to the defenders while the roaming playmaker aims to make himself available for picking the ball up from own half and carrying it to the opposition half. Mezzala's role is to dribble with the ball and create attacks from the middle while dropping deadly passes into the opposition penalty area. 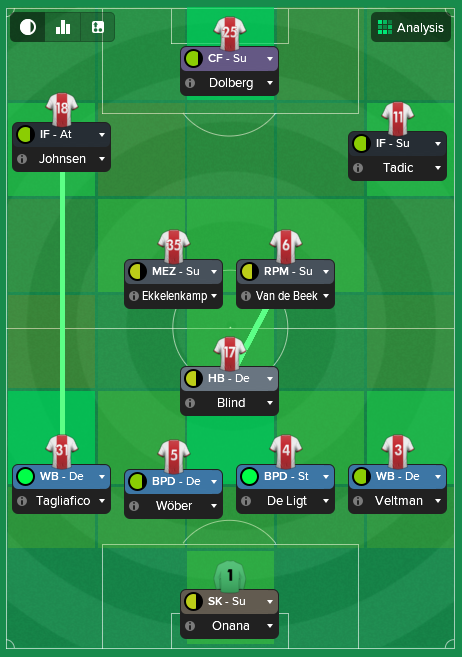 Note: Current injuries include F. De Jong, Orojuele and Kristensen and the wingbacks are on defend temporarily. We have had a fantastic kick off with the new season, scoring 5 goals against PAOK at an away match. Van de Beek scored a hat trick with a fantastic long shot goal. It was no surprise that we were able to pass the first qualifying round, matching with Sporting in the next one. Intimidated with the first away leg, I wanted my team to play cautiously, meaning less closing down and deep defence line. Although we had scored the first goal, Sporting quickly found 2 lucky goals and won the first leg. In the home leg, we absolutely dominated the game, playing in the opposition half for the entire match. We found the winner goal by Dolberg in the 79th minute, securing us the next round with the away goal. We again dominated the Liege game while Dolberg scored a hatrick with 2 penalties. I played the youngsters in the second game. Overall, we managed to secure a place in the group stage with PSG, Benfica and Hoffenheim. 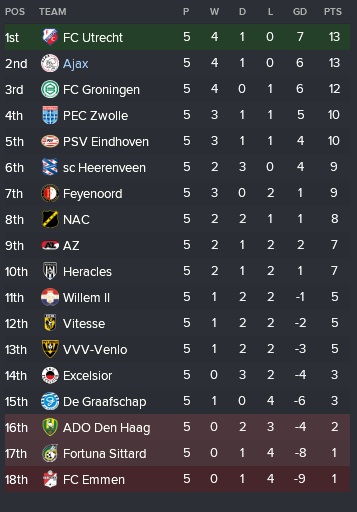 Things are going well in Eredivisie too. Currently, sitting in the second place with the highest possession rate and fewer conceded goals of the league - 59% and 2 respectively. You are reading "The return of totaalvoetbal".